Today I decided to warm up with a master study. 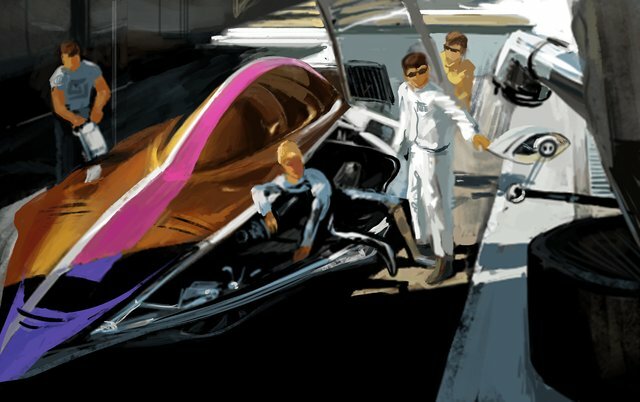 The original concept artwork titled "Speedhunters" was painted by the amazing Syd Mead. I chose this particular image because it was fairly simple with the main focus on the vehicle, I've tried to recreate the image with some of my own style. The point of this study was to try and deconstruct and understand why the artist made the choices they did and how I can recreate that. I avoided using any crutches, grids, colour picker tool etc and tried to rely solely on my own ability to determine shapes and colour from reference. I hope to do more of these in the future, they are a great learning tool to reference the greats. Very cool looks on this drawing. Excellent job, Jeremy! It is definitely a good practice to try and understand how the masters made their art. And the result here is beautiful as well :). I wonder what did you learn when you're painting this? I guess generally it helped to understand how to build shapes with light and shadow, reflections etc. One thing I love about the painting is the way the paint stripe is cooler in the shadows and glows. Thank you. Oh yes, you are right. I didn't notice it before. That's pretty cool actually :D.
Oh what an interesting exercise ! I eyeball everything also, so I can relate (somewhat) to the feeling to having to rely on one's own abilities to recreate something.... Very nicely done, @jeremyrfk! It's very convenient and works well most the time! Thank you.